The Laois Farm Forestry Group in association with Irish Wood Producers Ltd. are hosting a first thinning demonstration on Thursday 13th of November 2014 at 11.00 am. The event is taking place in John McDonald’s plantation, Ballyhuppahaun, Rosenallis, Co. Laois. Liam Kelly, Teagasc, will highlight the principles of first thinning in conifers and John McDonald will briefly highlight security issues involved in harvesting plantations. Following the site visit, Treemetric’s will give a presentation which will compare the harvest volumes from the site with the survey conducted earlier in the year. This promises to be a very informative event and will benefit many members of the group especially those with forestry approaching the first stage of thinning. The meeting point is the Deadman’s Inn, Ballyfin, Co. Laois at 10.45 am. Don’t forget to bring appropriate footwear and rain gear. Refreshments will be served afterwards in the Deadman’s Inn. Forester & Certification Co-ordinator Job application Deadline Reminder…….. The Irish Wood Producers would like to thank everyone who has submitted applications for our Forester an/or Certification Co-ordinator job Vacancies. We’d like to remind potential applicants that the deadline to apply is this Friday, the 24th October 2014!!! 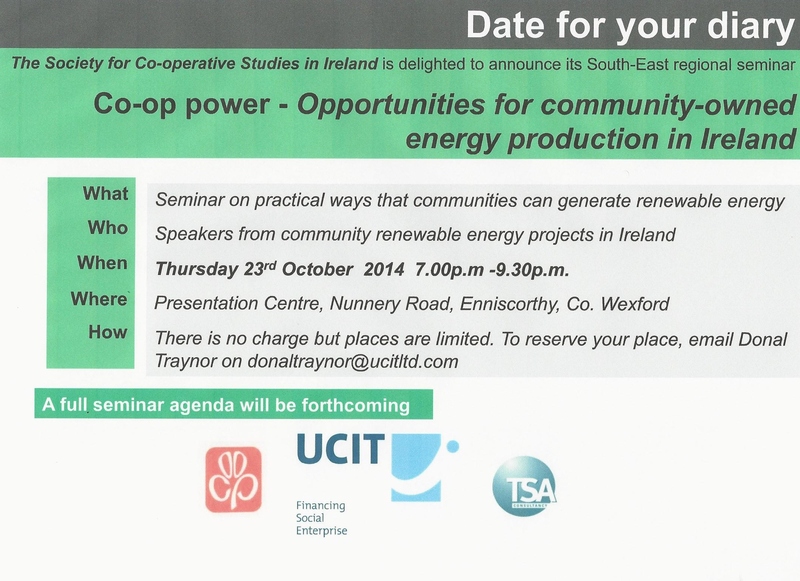 Not to be missed…… The society for Co-operative Studies in Ireland is delighted to announce its South-East Regional Seminar- ‘Co-op power-Opportunities for community-owned energy production in Ireland. Taking place on Thursday the 23rd October 2014 from 7pm to 9.30pm in the Presentation Centre, Nunnery Road, Enniscorthy, Co. Wexford. This is a free seminar however places are limited so email Donal Traynor today to reserve your place! Teagasc, COFORD and the Forest Service are holding a National Forestry Demonstration: Subsequent Thinning of Broadleaves with a focus on Sycamore on Thursday the 16th October 2014. Bus Transport from Community Centre to Local Woodland where leading experts from Teagasc and the Forest Service will provide professional advice on broadleaf management and thinning. Remember- this is an outdoor event so bring appropriate footwear and raingear!! !